Flavorseal’s High Temperature Cook-In Bags are made from a high clarity material and don’t adhere to the product, so it can be easily stripped away after cooking. Superior sealability means fast production lines. Excellent clarity for attractive final packaging. Available in forming and non-forming materials. 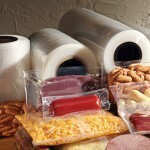 Vertical form fill and seal film designed for pouch making. Have your product stand out on retail shelves by adding color and shine. Flavorseal’s Low Temperature Cook-In Bags won’t shrink and can be used for many purposes. Seal in flavor and freshness with non-shrink vacuum seal bags. Improve yield and look of deli meats with Darlon casings. Protect meat packaging from exposed bones that could cause puncturing and leaks. Our Meat Soaker Pads have a highly absorbent core and a four-side seal that locks in moisture.